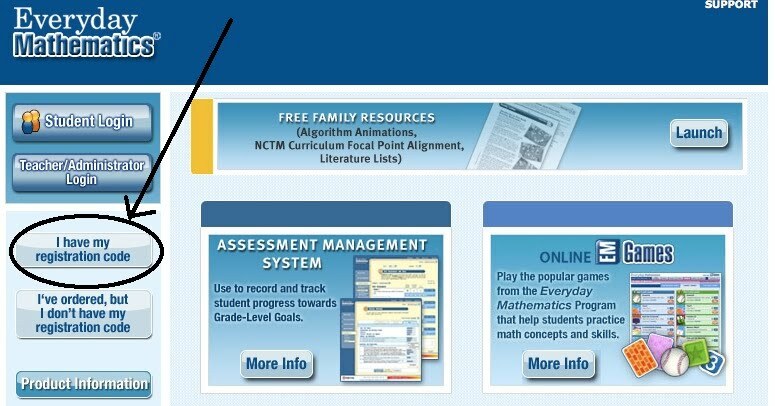 I mentioned on another post that our school district has adopted the Everyday Math Curriculum. In this post I would like to review some of the online components available with the program. 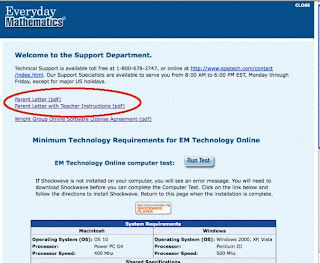 Everyday Math online is available a www.everydaymathonline.com. There is a wealth of information and resources available. Lets start with your basic set-up. Your school will give you a code that you will use to sign in the first time. To sign in click the ‘I Have My Registration Code’ button. You will be prompted for the registration code and guided through your account setup. 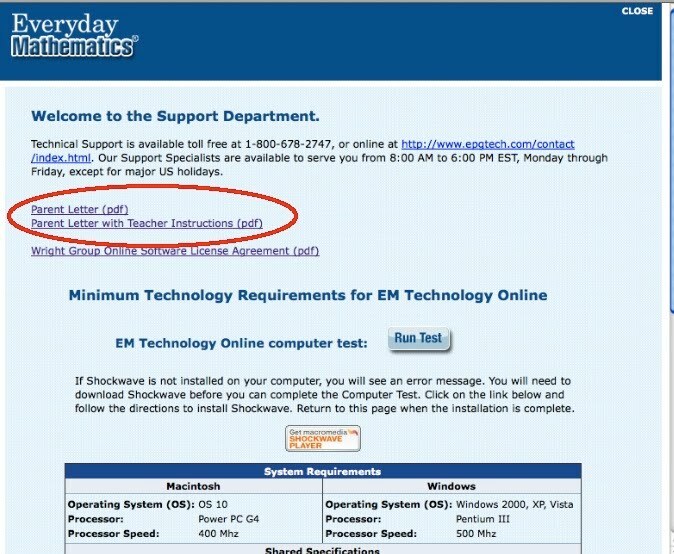 After setup, when you return to the EM website sign in using the Teacher/Administrator Login button. Once signed in, you will see the following screen and options. Take a moment to review the selections. I will go over more selections in future posts. Our district is putting student names into the system, but I believe we will need to put the students into our individual classes. To do this, select the ‘Build Class’ link at the top of your screen. A pop-up window will appear as pictured below. On the left panel (A) are instructions to help guide you through the class setup process. If you haven’t set up a class before, select (B) ‘Add Class.’ For more encrypted passwords, select the ‘Use Iconic Passwords’ box at the bottom of the ‘Add Class’ popup window. In doing so, passwords will have a letter, number, and shape. These are explained in the parent letter. 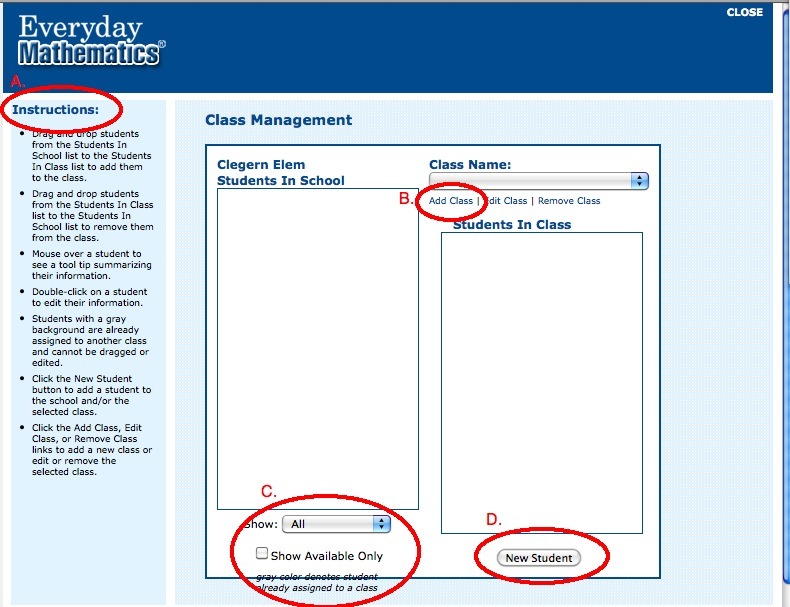 Once your class name is ready and selected you are can continue. Go to the bottom of the screen (C) and select the ‘Show’ dropdown box. Select your grade level. 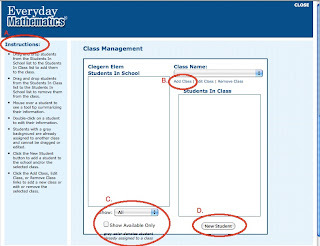 You may also want to select the ‘Show Available Only’ box so that students already in other classes won’t appear. 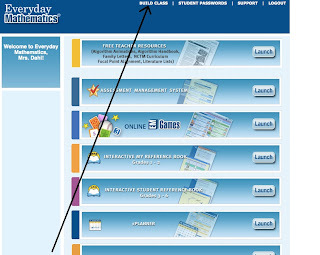 Finally, if you have new students to add select (D) the ‘New Student’ button. A pop up box will appear for you to enter student information. I do believe that our district is inputting students for us, we will just need to set up our classes. Now that your class is set up, let’s take a look at passwords and parent letters. Student usernames and passwords are automatically generated. Here's how to access and print the information. I entered a test student so we can see what the password page will look like. After selecting the above link, a popup box will appear. 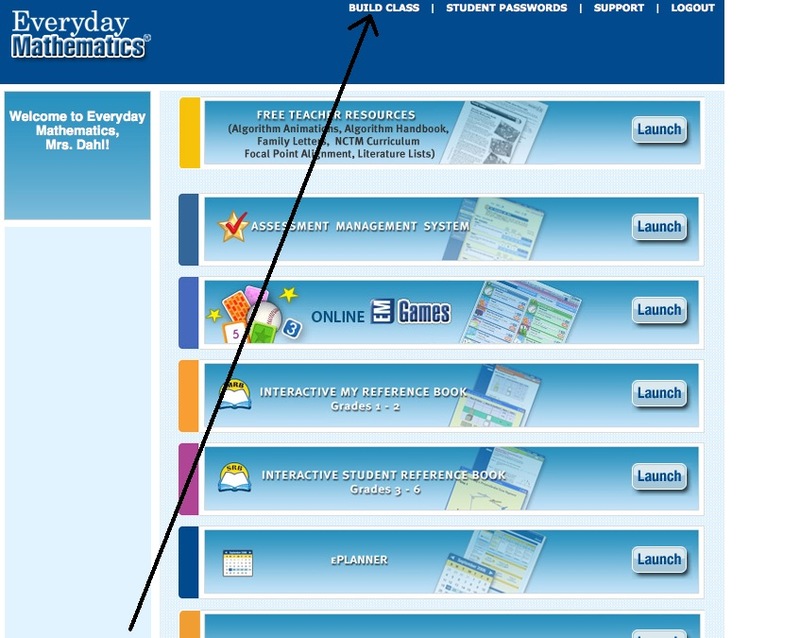 In this box we can see the student name, login, and password. 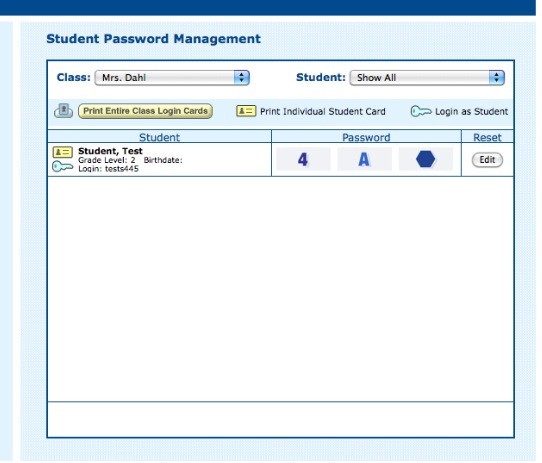 Clicking the ‘Edit’ button under the ‘Reset’ column will enable you to reset student passwords. 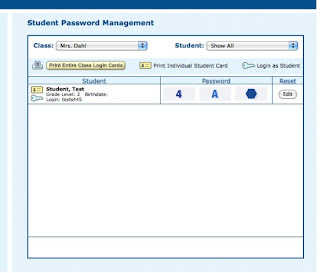 This screen is also where you are able to print individual or whole class login cards. Finally, from this screen you have the option to log in as your student. Now you’re all set up. Our last task will be to print parent letters. To print parent letters, you will need to return to your home screen and select ‘Support’ at the top of your screen. A popup box will appear with several support options. Two of those options are circled below. Both contain the Parent Letter, but the second also has some basic teacher instructions. That covers setting up your class, passwords, and parent letters. I will cover more online components if upcoming posts. If you have any questions, feel free to email me at gr8arteest(at)gmail.com. Have a wonderful school year! 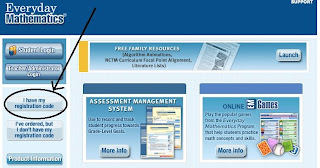 This a great tool for math tutors and math teachers because it offers templates to record their students' files and grades. It's easier to compute the students grade and class standing too.